Ingun Black-Briar is an aspiring Nord alchemist living in Riften. She is the sister of Hemming Black-Briar and Sibbi. Maven Black-Briar is her mother. She spends nearly every day training in Elgrim's Elixirs only to return home to sleep and eat meals. She needs help finding some alchemy ingredients; helping her out will reward you with leveled gold and a key to a storage chest that refills with some random leveled potions every few days. Also, if she is befriended, you can sleep in her bed. Ingun wakes up at 8am for a one-hour breakfast with her family at Black-Briar Manor. At 9am she goes to Elgrim's Elixirs to train in alchemy. At 5pm she returns home and has a two-hour dinner. She stays up until 12am, when she goes to sleep. Ingun wears a set of fine clothes along with a pair of fine boots and gloves. She carries her key to Elgrim's Elixirs, her key to Black-Briar Manor, three leveled poisons, a belted tunic, and a selection of upper-class items and gold. She wields a leveled dagger, which can be up to elven in quality starting at level 20. When near her, Ingun will say things like "Hm? Sorry, just thinking about my experiments. ", "My mind is on my experiments today. What did you need? ", and "What was it you wanted?" 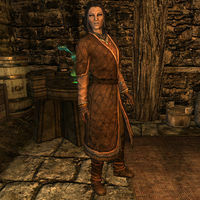 If you have not finished restocking her alchemy ingredients, Ingun may ask you, "Any luck gathering those ingredients?" Alternatively, if you have, she may instead tell you, "My experiments continue to go well thanks to you. How can I return the favor?" Upon ending conversation, she'll wonder out loud, "Now was it two parts giant lichen or three? Hm..." If you have not finished her quest, she'll say, "My experiments can't be completed until you've brought me those ingredients. Do hurry." If you have, she will instead remind you, "Don't forget to check your supply chest from time to time." If you offer Ingun a religious pamphlet, she will refuse with the words "Whatever you're peddling, I'm not buying." When Edda begs Ingun for some coin, she'll reply with "Sorry, all out of coin." Similarly, with Snilf, Ingun will say, "Sorry, no time. I'm late." You can ask her why she is so fascinated by alchemy. She'll tell you, "It's exhilarating to observe the effects of my potions on the body. Watching the heart stop... the eyes go blind. We're made up of thousands of parts with thousands of different functions all working in tandem to keep us alive. Yet if only a single part of our imperfect machine fails, life fails. It makes one realize how fragile... how flawed we are. You ask why I'm so fascinated? The irony... the irony that the same world that gave us life provides us the means to die." Unlike the rest of her family, she is not interested in their family business at all, wishing "to be much more than just a merchant." Should you ask her to tell you about her family, she will answer with distaste: "Hmph. My family. All that wealth and they squander it on foolish ventures and political schemes. I was meant for so much more than all of this... I wish to pledge my life and ply my talents in darker circles. If only my mother would let me, I would make her proud." Ingun's brother, Hemming Black-Briar can be heard talking about Ingun's lack of interest in family business as well, saying things like "My children [sic], Sibbi and Ingun, are being groomed to run the family business one day as well. ", "Sibbi will prove to be a fine leader one day, but Ingun... that girl has her mind somewhere other than business." and "Maven's disappointed that Ingun's heart isn't in the family business, but she says 'Ingun still has her uses.' Not sure what that means." To start this quest, you need to ask Ingun if she's an alchemist, which will have her reply, "I'm aspiring to earn that title, yes. However, the road ahead is paved with loose cobbles and deadly pitfalls. Master Elgrim says I'm a natural; that I have a unique talent. But I fear his approval masks his intolerance for my mistakes. My errant formulas have cost Master Elgrim a fortune in ingredients; some of which are almost irreplaceable." 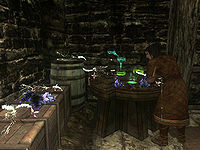 You can further ask her what sort of ingredients she needs, and she'll elaborate, "To restore Master Elgrim's supply I would need 20 deathbell, 20 nightshade and 20 nirnroot. Am I sensing that you may be interested in gathering these rare ingredients for me?" If you answer with "Sure, I'll get them for you. ", she'll be thankful: "That means more time for my experiments and less time in the field. Much appreciated." If you refuse by saying, "No, not right now. ", she'll reply, "Disappointing." If you've agreed to resupply the ingredients for her, you can ask Ingun for any clues where you can find them: "Nirnroot is the easiest. It grows only by the water and makes a unique chiming noise. The only drawback is it won't regrow after harvesting. Nightshade is native to the pine forest and marshy tundra regions of Skyrim and has a distinctive starburst-like violet flower. Last we have deathbell which only grows in marshy tundra terrain. Its inverted bluish-purple flower bunches are unmistakable." "I have deathbell for you." "Good, my experiments are at a critical stage and these are just what I need to finish. Here's some coin for all the trouble." "I have nightshade for you." "Perfect. This is just what I needed. Here's some gold for your time." "I have nirnroot for you." "Ah yes, excellent samples. Thank you. This coin should compensate you for all the bother." If you have brought her everything she needed, you can mention to her that that was the last of the ingredients. She'll say, "Yes, Master Elgrim will be pleased I've restored his stock of these rare ingredients. I feel I owe a bit more than some meaningless coin for all your diligence. Here, this key unlocks my supply chest at Elgrim's Elixirs. Feel free to take what you need from time to time. I'll be refilling it once every few days or so." Maven: "Ingun, how much longer do you intend to waste your life concocting your foolish little potions?" Ingun: "I've told you, my interest in the family business is quite low. I wish to be much more than just a merchant." Maven: "Your interests lay where I wish them to lay otherwise my favorite daughter may end up homeless and without a septim to her name. Is that clear?" Ingun is a member of the assassin class, which determines the level of her skills. Some dialogue and scripts identify Ingun and Sibbi as Hemming's child. This is accepted as wrong, with the weight of evidence suggesting she is Maven's child and Hemming's sister. This page was last modified on 17 October 2018, at 23:20.